Here at Curry Masala, an Indian restaurant in Rapid City, you will find friendly people, good food and more. Of course, you will find a vast selection of Indian Food every week. We serve healthy curries and desserts from different regions of India. 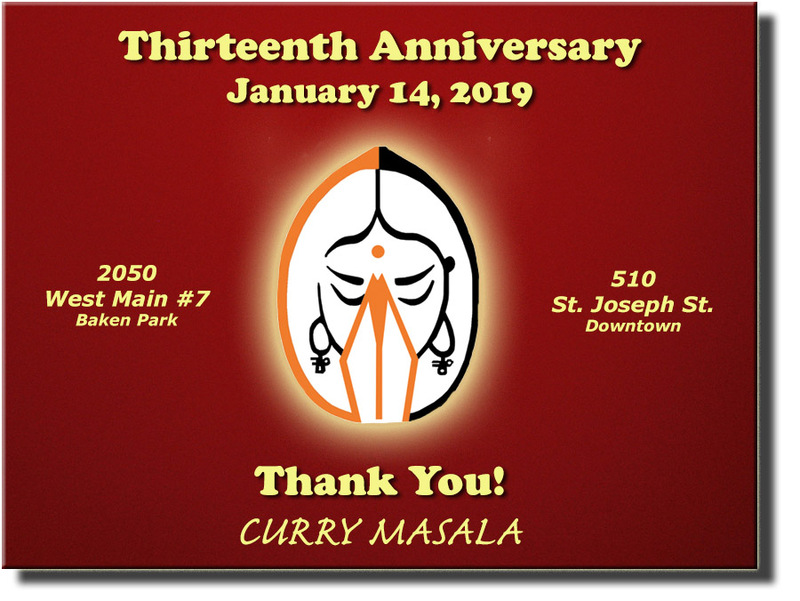 We have been serving the people of Rapid City healthy Indian food for the past 10 years. One of the first few restaurants in the nation to offer Gluten free, Dairy free and Vegan menu for the past 10 years. Our philosophy here is all about fresh, delicious, healthy meals that are of the best quality, at the most realistic prices. We offer differnt dishes each week for you to choose from for lunch. All the curries are gluten free and dairy free (except for tandoori and butter chicken). All of our vegetable curries and rice are vegan friendly. We offer gluten free dessert also. We also serve halal meat menu items. No frying too! Curry Masala, Indian Restaurant in Rapid City, South Dakota. Weekly Menus, Weekend Specials. Dine in, Catering, Curry Out. 2050 W. Main Street, Suite 7, Rapid City, SD 57702 * 510 St. Joseph Street, Rapid City, SD 57701.